Sacks of feed are most often stitched closed at both ends with string. That means there are two tails of string at each of the four corners of the sack. Two of those eight tails are the magic strings – which when pulled, will unravel the stitching and open the bag. The other tails are duds, and won’t unravel the stitching, no matter how much time you spend picking and pulling at them. Here’s how to find a magic string. Usually, each end of a feed sack is sealed up with a wide strip of paper or plastic folded over the end, with a row of stitching on top. On one end of the bag, either on the front or the back, there’s also a narrow marker strip of paper or plastic running underneath the row of stitching. Sometimes it’s a contrasting color or is marked with an arrow printed on the bag, and is easy to find – and sometimes not. On this bag of sunflower seeds, the marker strip is not easy to see because it’s black like the wider paper strip underneath it. 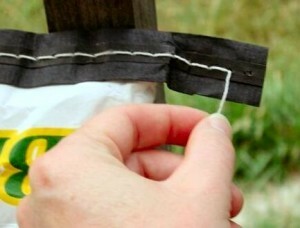 Set the feed sack up with the marker strip at the top, then pull the string on your right to unravel the stitching and open the bag. 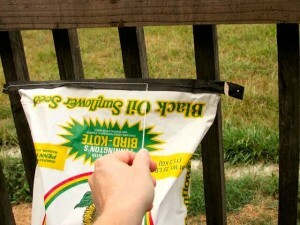 Once you’ve located the marker strip, set the bag up with the marker strip at the top, facing you. The magic string is the loose end on the corner of the bag to your right, on the side of the bag facing you. Grab that baby and pull! The string stitching should unravel easily all the way across the top of the bag…and there you are!